In 2001, the American Legion built a new state headquarters in Portage. 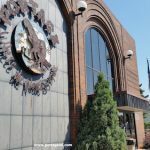 The headquarters employs seven full-time people and houses a museum full of plaques, statues, uniforms, medals, photos, and documents from the history of Wisconsin's American Legion. The museum is open Monday through Friday, 8:00 a.m. to 5:00 p.m. and is located on American Legion Drive on the north side of Portage. Call (608) 745-1090 for more information. Containing six early churches and many prestigious homes built between 1855 and 1930, it is only two blocks from the downtown area. The Church Hill District was listed on the National Register of Historic Places in 1997. Built in 1824 by portaging businessman, Francis LeRoy, the Fort Winnebago Surgeons' Quarters is one of the oldest French Colonial log homes in Wisconsin still standing on it's original foundation. 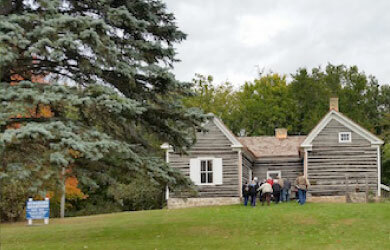 The only remaining building of historic Fort Winnebago (1828-1845), Surgeon's Quarters overlooks the site where Louis Joliet and Father Jacques Marquette left the Fox River at the east end of Wauona Trail in 1673. In 1828, soldiers came to erect the fort, the middle link in a chain of three forts along the Fox-Wisconsin waterway. Fully refurbished as a home of army occupation days, authentic period furnishings include intriguing Fort Winnebago artifacts, including the original hospital operating table. Also on site is Garrison School - used continuously from 1850-1960. Surgeons' Quarters was listed on the National Register of Historic Places in 1970 and is open from May 15th to October 15th. Interactive guided tours are available Tuesday - Sunday from 10 a.m. to 4 p.m. An admission fee is charged. Group and family rates are available. Closed on Mondays. The site is operated by the Wisconsin Society Daughters of the American Revolution. Call 608-742-2949 for more details or a calendar of events. 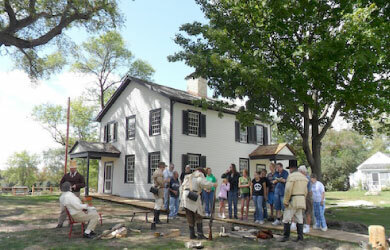 The Historic Indian Agency House, built in 1832, is one of Wisconsin's earliest houses. It was constructed by the US Government as a residence for the Indian Agent to the Ho-Chunk (Winnebago). 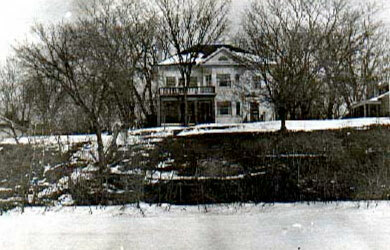 The Agency House is on its original site above the Portage Canal, located off Highway 33 east of Portage on Agency House Road. The house was placed on the National Register of Historic Places in 1972. 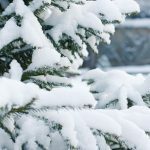 Call (608) 742-6362. Including commercial buildings that were constructed around the Portage Canal as it ran through the center of the city, this district was listed on the National Register of Historic Places in 1995. The William L. and Zona Gale Breese home at 804 MacFarlane was donated to the City of Portage in 1946 to house the Portage Public Library. 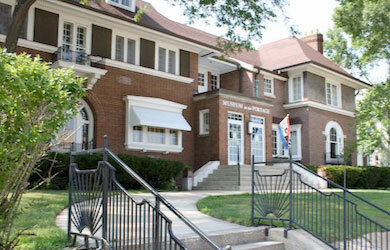 In 1994 the library moved to a new location and in 1996, the Museum at the Portage was established to showcase displays relevant to the history of the city. The Portage Historical Society works continually to honor the rich history of Portage, the third oldest settlement in Wisconsin. Within the Museum at the Portage, Zona Gale's study is preserved as it was when Zona lived in the house. Included in the permanent collection displayed at various times during the year are photographs and artifacts representing historical events in the city's history. Call (608) 742-6700 for more information. The idea for a canal to connect the Fox and Wisconsin Rivers was developed in the 1820's and 1830's. The canal in its current location was dug by hand from 1849 to 1851 and then improved after the Civil War by the Army Corps of Engineers. 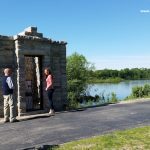 The canal was finished in 1876 and at its peak for recreational boat traffic in 1908 with 1,461 lockages at the Fort Winnebago lock going into the Fox River and 127 lockages at the Portage lock. 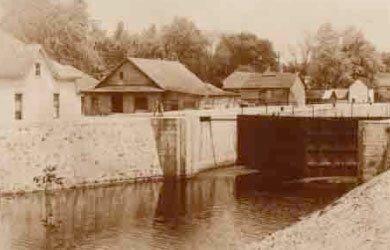 By 1950 the number had dwindled to only 8 to the Wisconsin River and the following year, the Portage locks were welded shut. The canal was listed on the National Register of Historic Places in 1977. This residential district of 138 buildings was home to the city's early prominent citizens. Many of the buildings are made of yellow Portage brick and were constructed between 1870 and 1910. Society Hill contains the homes of two Pulitzer Prize winners; playwright Zona Gale and historian Jackson Turner. Society Hill was listed on the National Register of Historic Places in 1992. After the successful publication of her first novel in 1906, Zona Gale built this home for her parents on the bank of the Wisconsin River. It's classical Greek revival exterior is in contrast to its rustic Craftsman interior. Her 1920 novel, Miss Lulu Bett, shared best seller honors with Sinclair Lewis's Main Street. The dramatization of the novel brought her the Pulitzer Prize in 1921. Her home was given to the Women's Civic League in 1932 and was listed on the National Register of Historic Places in 1980. It is open to the public and can be viewed by appointment for a nominal fee. Call (608) 742-7744.